Oooh So Sweet, and right around the corner! Working in the Mount Vernon area there are a variety of choices when it comes to food, but sweets are harder to come by. I’d seen Ooh So Sweet many times while walking over to City Cafe or Plaza Art, but it never seemed to be open. A few weeks ago I ended up talking a photo of their hours so that I could get there when they were actually open and baked fresh. When I finally managed to stop by during business hours, the friendly staff picked four cupcakes for me to share and taste. It took a few minutes for them to pull them together and I think it is because they are frosted to order! Frosting to order is a great way to make sure that toppings stay fresh and frosting doesn’t get crunchy – I wish more cupcakes places did this! I took the cupcakes with me to share with the other Crusaders, Leah (Crusader Jenn’s daughter), and our friend Jessica, after lunch at David and Dad’s Cafe. After eating our delicious lunches and catching up, we got into the cupcakes! Cinnamon and sweet, with a yummy filling! Moist, airy cake was complemented by the creamy, but slightly runny, pudding like filling and sweet sweet frosting. The filling oozed out of the side when Crusader Stacy unwrapped it, and made note that without a fork, this filled cupcake might be difficult to eat. We all agreed, but were also too busy savoring our bites to care too much. Red velvet and chocolate cake batter swirled together should be baked more often! The cake, again, was moist and airy with great flavor. The frosting was a bit on the sweet side for me, and the Crusaders thought it tasted like it was “out of a tub,” not homemade. That didn’t bother us too much, as we all enjoyed this cupcake, even Crusader Jenn said she liked it, noting that, in general, she doesn’t love red velvet cupcakes. 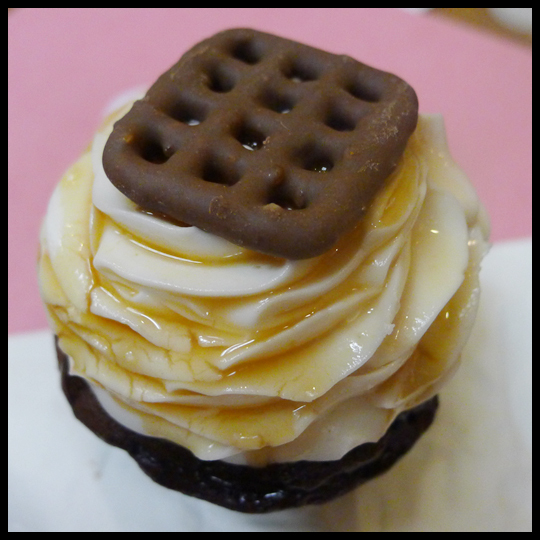 We all love salted caramel, and we all enjoyed this cupcake. Again, the other Crusaders thought the frosting tasted like it was “Duncan Hines” tub frosting, but also noted that didn’t bother them. (I’ve been out of the tub frosting loop for so long now, since I only ever make homemade, they pointed out that there have been many advances and that tub frosting has come a long way in a short time. Who knew!?) The moist chocolate cake had great flavor and I really loved the caramel drizzle. One of the best parts was the chocolate covered pretzel on top, which was still crunchy! WOW. We loved this cupcake. The moist cake had an interesting mix of real strawberry flavor and “fake” or freeze-dried strawberry flavor. 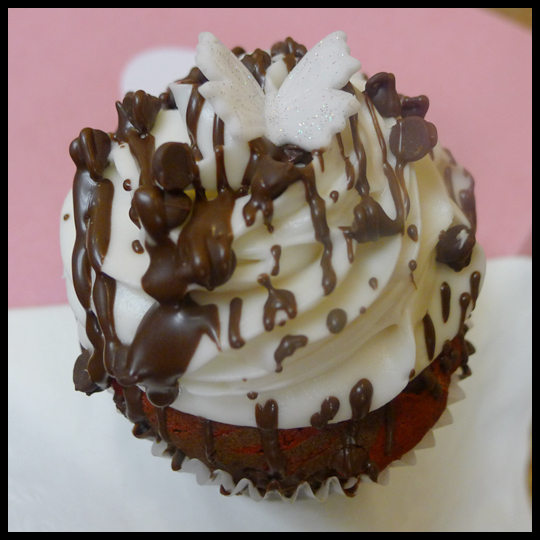 With all of the sweet frosting on the other cupcakes, we all agreed that the dipped ganache topping of this one was the perfect complement to this cupcake. By far, this cupcake was our favorite of the four. Overall, we really enjoyed the four flavors from Oooh So Sweet. Their moist and airy cake was a delight, and we all loved how beautifully decorated all the cupcakes were. 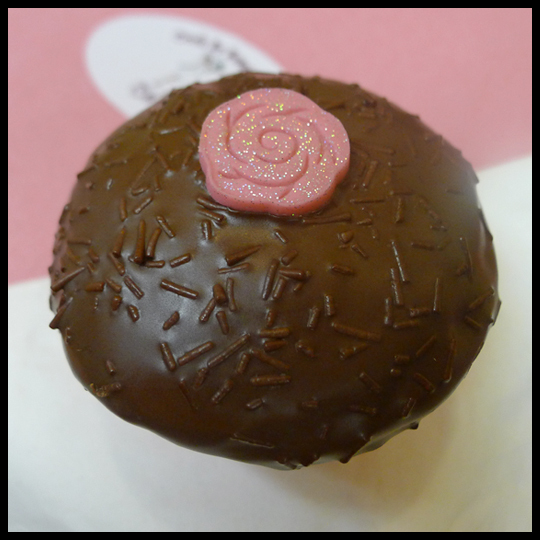 It’s great to have a cupcakery right around the corner from work, even if the hours are a bit odd, and I might just have to swing by soon for another Chocolate Covered Strawberry Cupcake! This entry was posted in Baltimore, Cupcakes, Maryland and tagged Chocolate Covered Strawberry, chocolate salted caramel, City Cafe, cupcakes, David and Dad's Cafe, Oooh So Sweet, Plaza Art, snickerdoodle by Crusader Elisa. Bookmark the permalink. Poshtoganache, I totally agree! We were “ohhh’ing” and “ahhh’ing” over the butterflies and the little rose. Such nice little touches! 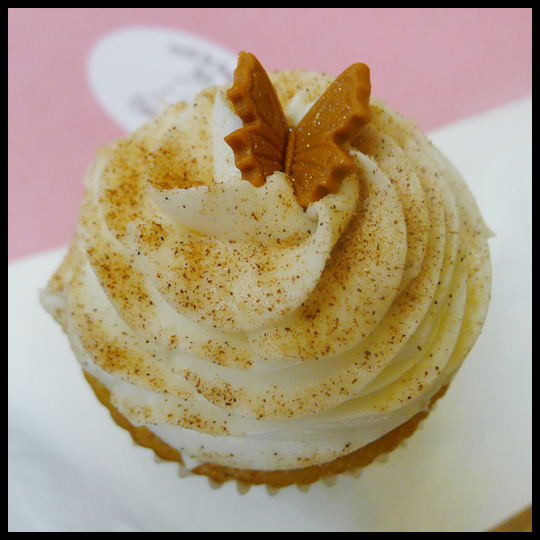 The snickerdoodle is so cute with that little butterfly.That Sweet Sin is truly sin worthy. YUM! that looks like a place to hit up again.